Pizzelles are a light, crisp, slightly sweet cookie that taste terrific plain or dressed up with your favorite toppings. 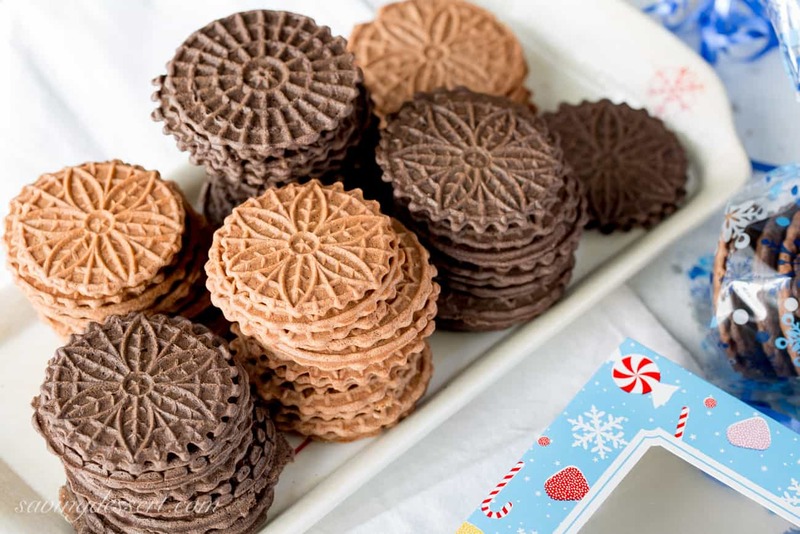 These Chocolate Pizzelles were made with regular natural cocoa and special dark chocolate cocoa for a special holiday treat. The thin 3-inch cookies are a blank canvas waiting to be adorned or dipped and are wonderful eaten along with a small bowl of ice cream. In fact they make a pretty wonderful ice cream sandwich too! These are dipped in white chocolate then sprinkled with coconut, crushed peppermint, mini-chocolate chips, chopped pistachios or walnuts. Christmas or holiday sprinkles would work beautifully too! Pizzelles remind me of my mom and grandmother. 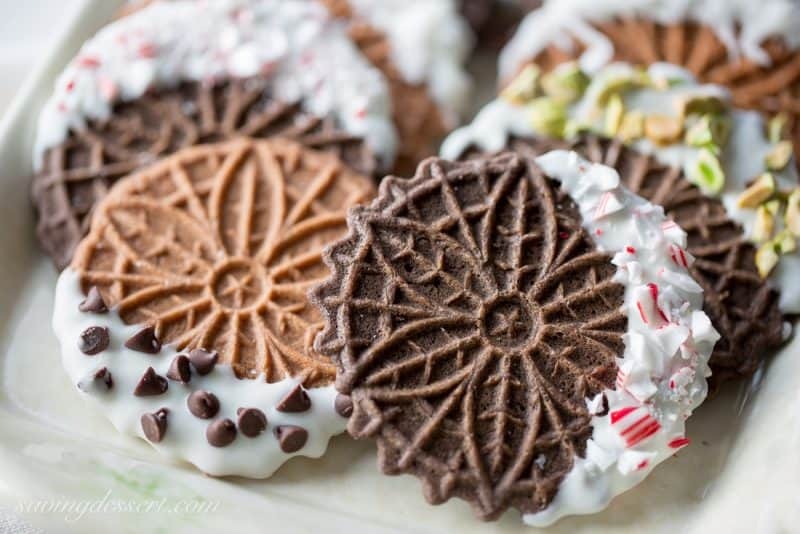 I remember enjoying anise flavored pizzelles at my grandmother’s house and always loved the chocolate version too. My version was adapted from her recipe and I think she would have approved of the dark chocolate cookie too. 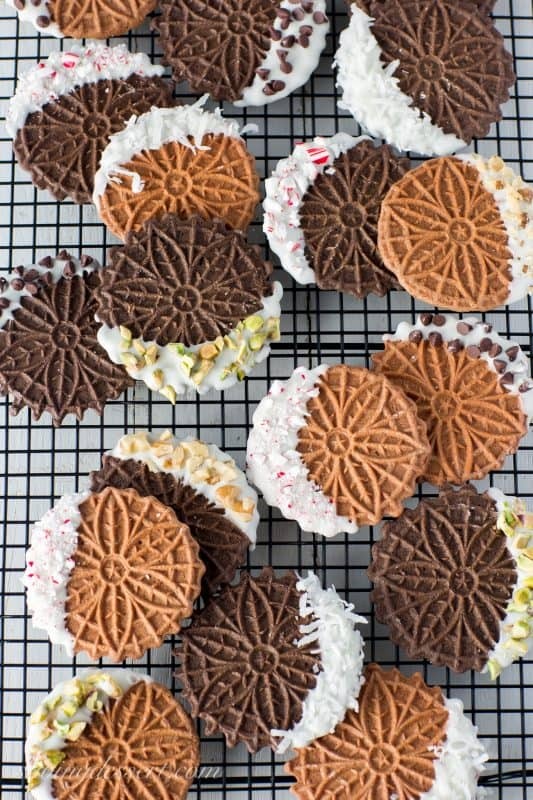 The dark cookie reminds me of an oreo without the middle. My husband preferred the lighter version, but I loved them both! Milk chocolate or dark chocolate would be fun in place of the white chocolate – but these seem like to Christmas to me! In a medium mixing bowl whisk together the flour, cocoa, salt and baking powder. 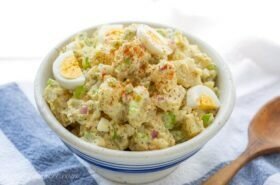 In a large mixing bowl vigorously whisk together the eggs and sugar until blended. Add the vanilla and melted butter and whisk until combined. Sift the dry ingredients into the butter and egg mixture and fold together with a spatula. This batter will be thick. Heat your pizzelle iron until a drop of water sizzles on the cooking surface. Lightly coat the hot iron with nonstick cooking spray. Scoop the batter into a pipping bag fit with a large tip (or cut the corner from a ziplock bag) I used a large Wilton 2A tip. Pipe about 1 tablespoon batter into the center of the iron and cook according to your manufacturer directions. If they are too big for your press, pipe a little less the next time. It will take a few tries to get them just right. Remove the hot pizzelles to a wire rack to cool. Melt the white chocolate chips and coconut oil in a microwave on 50% power for 1 minute. Stir and repeat as needed until the chips are melted. Dip or drizzle the cookies as desired then sprinkle with your favorite toppings. The white chocolate hardens quickly so have all your toppings ready to go before starting. Sprinkle with powdered sugar or fill with your favorite ice cream and freeze until set. Store cookies in an airtight container. Plain cookies can be frozen well sealed for a month. Have you ever been to a “gender reveal party?” All the young folks do this now. They find out from their doctor whether they’re having a boy or girl. The secret is put into an envelope and given to the parents but they don’t peek! Then they pass the envelope to a friend who helps organize a co-ed party where everybody will find out at the same time if they’re having a boy or a girl. We went to a gender reveal party yesterday (for our son and daughter-in-law) and found out we’re having a granddaughter in April! This is pretty exciting and I was thrilled to be part of the fun. They had pink and blue themed decorations and beads and stickers you could choose if you were guessing the gender. We’re having a co-ed baby shower in February – which will also be a first for me. I love that the guys are getting into these events – it’s not like the old days. In fact my son wore a shirt to the gender reveal party that read “The Man Behind the Bump.” I think it’s pretty cool! Callie and Patrick are thrilled and had all their friends over to share the news. They did hand prints in pink paint to commemorate the event. Dang I wish I had looked like that at 24 weeks – Callie is such a little cutie and a wonderful daughter-in-law! Patrick and Callie love to ride motorcycles on the weekends with their friends … they are “Harley” people all the way. They also have a good friend (Eric) that is a professional motorcycle stunt rider and his team often uses special tires that smoke in different colors. Good old Red, white and blue is very popular at patriotic events. Patrick arranged for his friend to buy a stunt tire (in the appropriate color) and borrowed a sport-bike do a “burn-out” as their “gender reveal.” Callie stood next to Patrick and he started the motorcycle, and then he burned it up! This is the moment they found out about their little girl. I cried, what can I say … it was unique, (loud), exciting, and fun! Thanks so much for stopping by! Hope you have a wonderful week. I loved this recipe but it didn’t make 60 cookies. I followed it exactly (used Hershey’s Soecial Dark cocoa) and used a one tablespoon scoop to measure each cookie, which is what I do all the time. (They taste really chocolatety.) The scoop’s the measure that makes one pizzelle cookie in my iron. I make regular anise oil flavored pizzelles all the time with a recipe from my Italian MIL which also produces a very thick batter. This recipe made 30 tasty cookies. Next time I’ll double it so I can decorate with a variety of toppings. Thanks Soozie – glad you liked them. Each pizzelle iron is different and mine are pretty small. Glad you enjoyed them and hope you had a wonderful holiday. These came out great! Made them with gluten free flour and you would never know. My granddaughter wants me to decorate them so that is next! Thanks for posting! Thank you Debii! 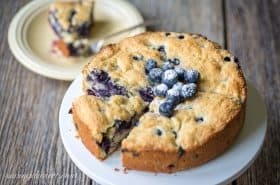 Wonderful news that you liked them and especially since you used gluten free flour. Decorating these is such fun! Thanks for trying them and for letting us know. 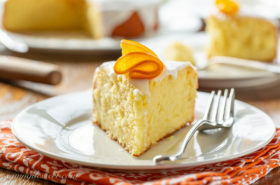 It’s great to hear good news about a recipe! These pizzelles look amazing. I always loved helping my mom make them as a kid and couldn’t wait to eat them as she wasn’t looking! What a fun gender reveal, so happy for you and your family! Thanks Diane – I always loved baking with my mom – thank you so much! 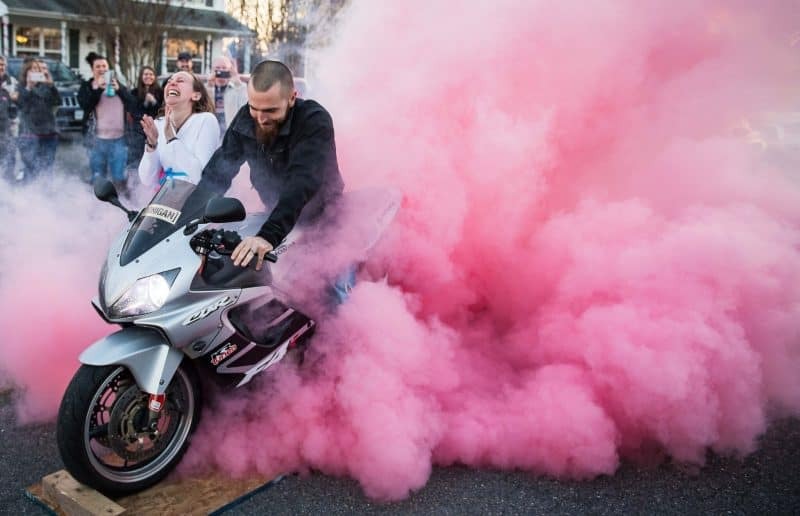 What a fun way to do a gender reveal! I love it! And your pizzelle cookies look absolutely amazing — I love pizzelles, and have always wanted to try making them at home, but have never gotten around to getting a pizzelle maker. Now I have no excuses! 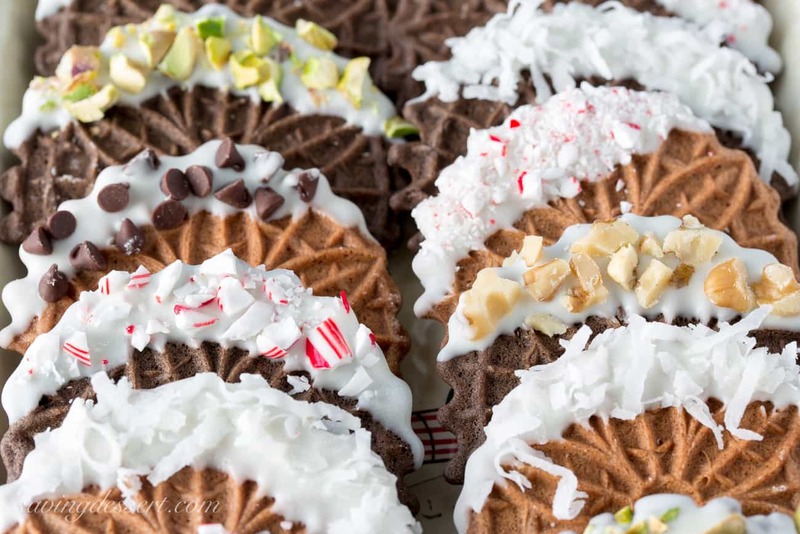 I’ve never had pizzelles dipped in chocolate and other tasties, either, so I will definitely have to try that! Thank you so much Willow! These are so easy and delicious and I do love the extras too. The dark chocolate and coconut was my favorite – not that I tried them ALL – well maybe 🙂 Heading over the Facebook – thanks for the invite! Pizzelles are wonderful, aren’t they? Yours look perfect! Never made them — really should get with it, don’t you think. Never been to a gender reveal party, but I can’t imagine any topping that one! Sounds like tons of fun — loved the pictures. Thanks. 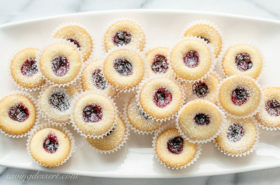 Thanks John – I love them too – so many childhood memories around cookies and pies. Great times in the kitchen with my mom and grandmother. 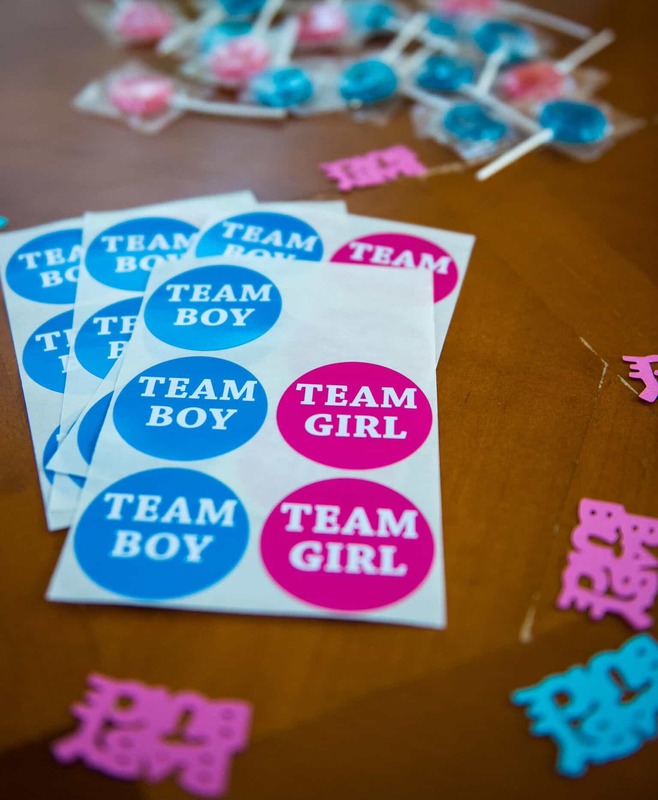 It was an exciting gender reveal party – who knew!!! Absolutely adore your cookies and things certainly have changed over the decades. 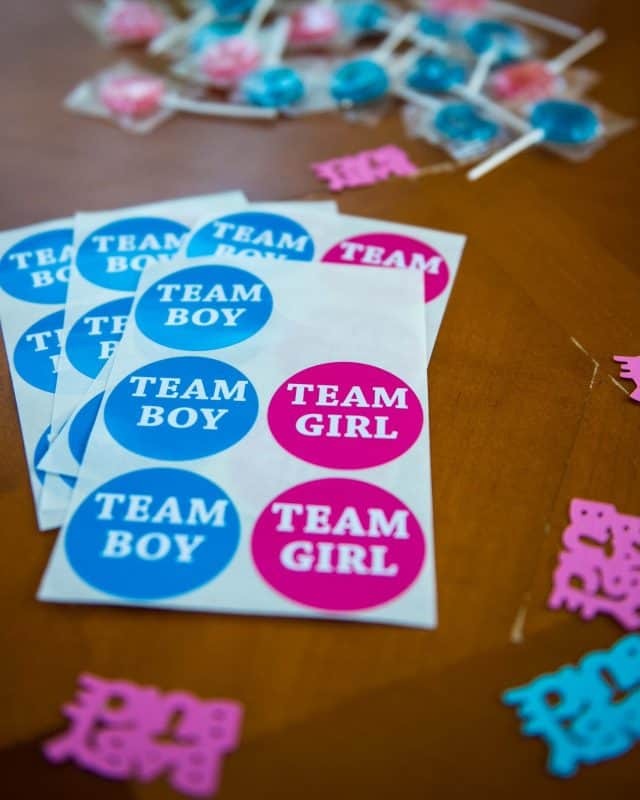 Never even heard of a gender reveal party – what a fun idea and congratulations on the news of a granddaughter. Congratulations Tricia!!!!! I am so excited for you and your family. These pizzalles are truly a stunner! Congratulations Tricia, what would I give for a granddaughter . Your pizzelles look gorgeous . Thanks Gerlinde! We’re looking forward to adding a cutie to our little family. Have a great week. I have always loved the look of pizzelles but have resisted the urge to buy another kitchen ‘toy’ 🙂 They are beautiful, Tricia and I would love the chocolate flavor. Oh dear! We really thought it would be a boy Susan – so happy to add a girl to our family. Our daughter is expecting in June but we don’t know what she’s having yet. Her son is Issac our little bruiser 🙂 Have a wonderful week and thanks so much for stopping by! Hi Becky! My son and daughter-in-law found out when we all did – it was so fun. They are excited beyond words. It is such a blessing to see two people so much in love. They’ve been married 3 years now and are ready – or at least they think they are 🙂 Have a great week! 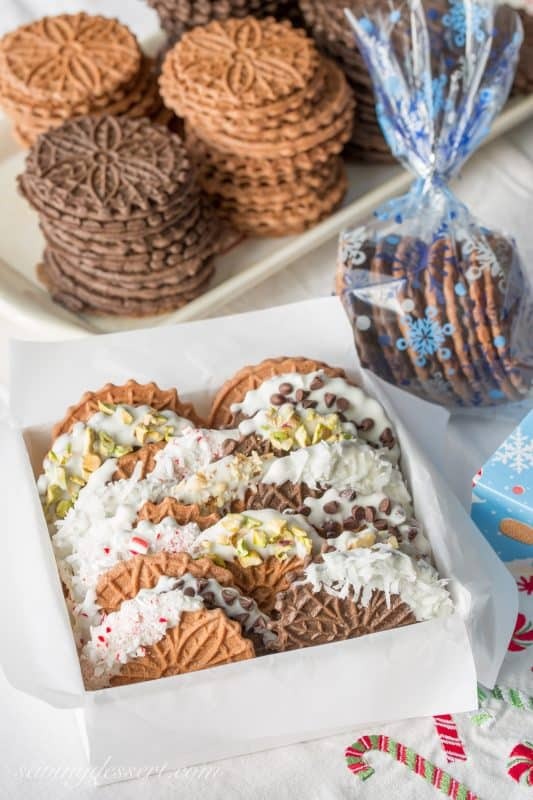 This is a great idea to dip the pizzelles..funnily enough a pizzelle maker was on my list for Fl..and I had no clue which one to buy..so many mixed reviews..
Do you use an electric pizzelle maker? If so may I ask which brand?As yours seems to do a great job. Great pics,and your blog is so lovely.Even the comment section. Hi Monique! Pink sprinkles are perfect for the way things are going around here! I meant to put a link to my pizzelle maker – I am very happy with it. It makes three small (3-inch) pizzelles at a time. It has a wonderful non-stick surface and seems to cook evenly. Here’s a link to the Chef’s Choice 835 Pizzelle Pro Express Bake . I bought it a few years ago and have really enjoyed it. I don’t use it all the time but the few times I have made pizzelles, I was very pleased. I also have a post for Anise flavored Pizzelles if you would like that recipe too 🙂 Thanks so much for stopping by! I love the cookie stamps and molds too Wendy – it’s just that the ones I want are crazy expensive! Let me know if you come across some great deals. It was a very fun event and very unique indeed! I think people would have a hard time one-upping this reveal 🙂 Thanks so much for the link-love too! I bet you have a few family members that would be good at blogger gifts – like old spoons and pizzelle irons! Have a lovely day! Oh Tricia – you make me wish I had a pizzelle maker! These chocolate versions steal my heart! We have been dipping cookies in chocolate and having fun but we don’t have cookies as beautiful as these. They look perfect for Christmas. And woah, you packed some huge happy news there! : ) So very excited for you and your family! 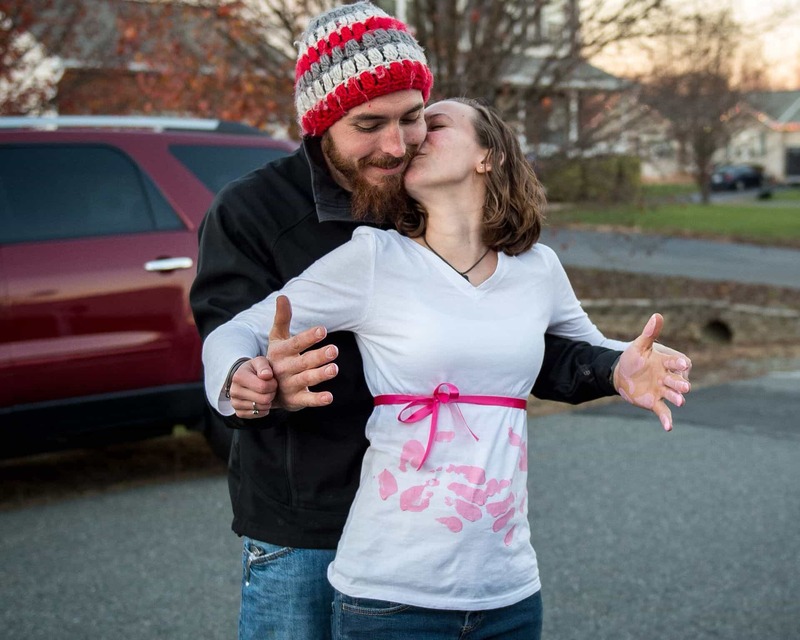 A granddaughter to look forward to is incredible news. Yay!!! That party looked amazing, btw. I don’t use it often enough Monica – the one I have makes three at a time and it really goes super fast. Thanks so much! Those pizzelles are incredibly beautiful Tricia but that pink smoke steals the show! What a fun, unique and totally memorable way to discover the gender. Congratulations, you will LOVE having a little girl!!! Thank you Chris! You have the most beautiful granddaughters and I’ve always loved how you do baking projects with them. Pass it on! 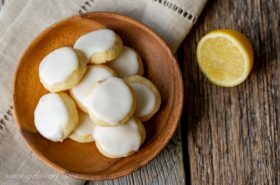 Your cookies look wonderful – no surprise, all your recipes do! And congratulations on your granddaughter-to-be. Such exciting times! 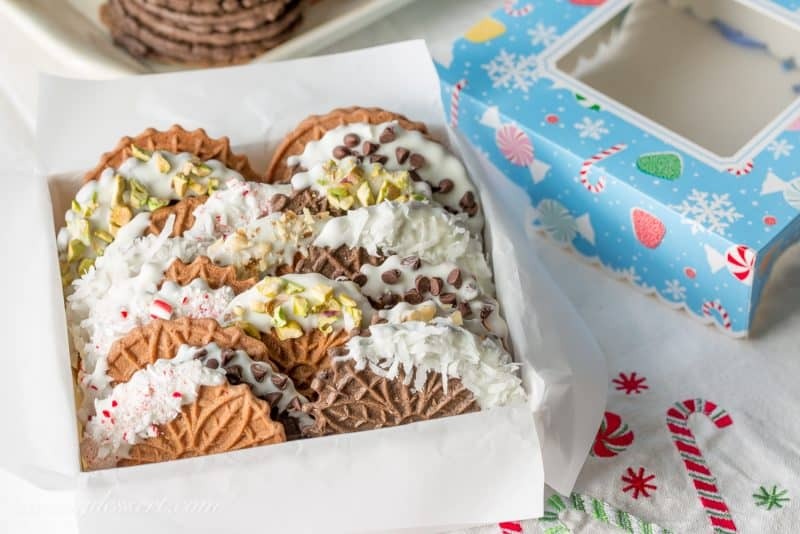 Your pizzelles are so perfect I thought you bought them and decorated them for this post — I THINK, but I’m not sure, that I might have a pizzelle iron, I found it at a thrift store but I’ve never known what to do with it, I’m going to try it out with this recipe! Thank you so much Sue 🙂 It is exciting and fun and I do look forward to all things pink!